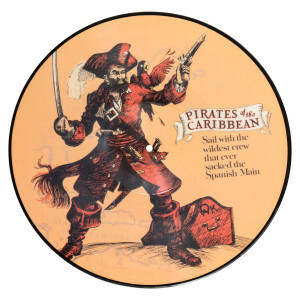 Set sail and celebrate the 50th anniversary of the Disneyland attraction with this collectible vinyl picture disc features classic attraction poster art designed by Collin Campbell in 1967. Make your buccaneer adventures complete with music from the attraction itself including “Yo Ho (A Pirate’s Life For Me)”. Earn 100 Disney Movie Reward points with the purchase of this product. Disney Movie Rewards is open to legal residents of the 50 United States (and D.C.), Puerto Rico and Canada age 13+. Void in Quebec and where prohibited. For complete details and Terms and Conditions, visit DisneyMovieRewards.com. I was so excited to see this actually existed! Side one is a perfect example of actually being on the ride! The ride was closed the last time I went to Disneyland so I was happy to at least order this. 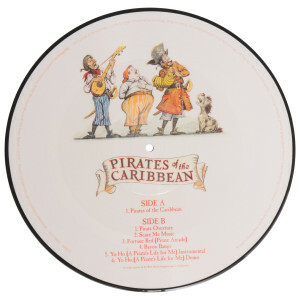 Side two is also a fun mash up of the theme songs. WELL WORTH the money. Shipping was fast and easy and it came very well packed. 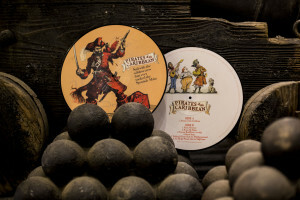 I will be buying the hunted mansion and hopefully A Day at Disneyland vinyl as soon as it is restocked! Now all I need is Walt Disney’s enchanted tiki room and I would be set! Love this record so much! Side 1 is like being on the ride. Haunted Mansion one is also like this. So good!